Tiramisu means pick me up, and this dessert does just that. Okay, the coffee helps, but I also attribute its appeal to the fact that this is truly bliss-in-a-dish. I soon discovered that that this is one of the easiest desserts to make. (A HA!) You may spend more time locating the ingredients than creating the dessert, especially if you live in rural Oregon. Keep a line on your suppliers — once your family and friends taste it, the requests will pour in. Savoiardi: If you can’t find the cookies locally, purchase from a specialty shop online. Make sure they’re crisp. Okay, hard. On they’re own, I find them inedible. Moistened with coffee and liqueur and used as a vehicle for the custard, they’re perfect. Mascarpone: All mascarpone is not created equal. Italian imported is, of course, the best, but a 1 lb. tub may set you back $15 – $20 dollars. Find it at specialty groceries or cheese shops. There is an American version I find locally which is sufficient, but I do notice the difference in both taste and texture. Espresso: If you don’t own your own machine, ask a coffee shop for a deal on 4 to 8 shots in a cup. If you want less caffeine and milder coffee flavor, go for 4 long shots drawn out to 1 cup. If you don’t mind the caffeine and want the coffee punch, ask for 8 ristretto (short) shots. Liqueur: Restaurant Tiramisu often has strong alcohol in it, such as cognac or rum, which I feel overpowers the delicate taste of the mascarpone. Some recipes call for coffee liqueur; I use amaretto. If you want a non-alcoholic version, use a tad more coffee. I wouldn’t choose to go non-alcoholic, but if I had to, I’d add a bit of almond extract to the coffee. Serving dish: 9″ x 9″ is a little small, but 11″ x 13″ is large, so if you have something in the middle… A deep dish works well so the top cocoa layer doesn’t stick to any lid when it’s covered. 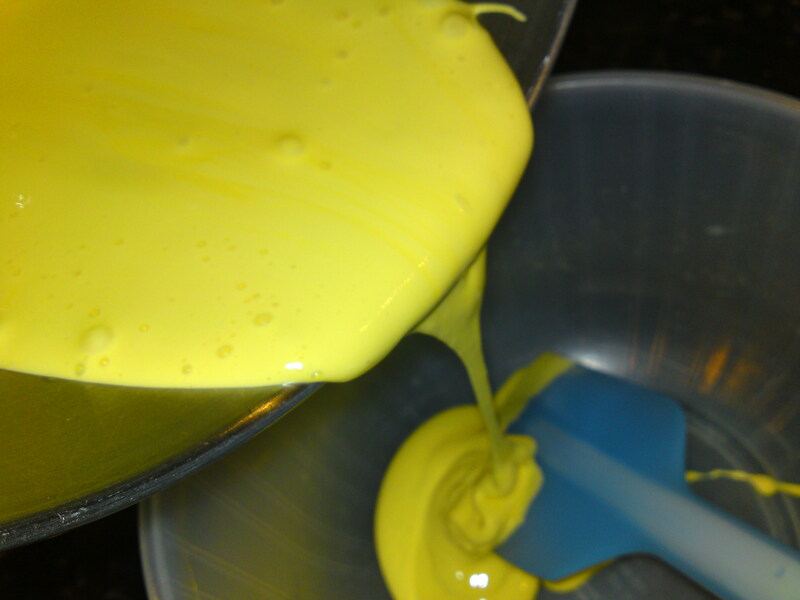 Beat or whisk the egg yolks for a couple of minutes until they start to thicken. While gradually adding the sugar a spoonful at a time, continue beating the yolks until they thicken and appear pale in color (5 – 10 minutes). Gently beat in the mascarpone until the mix is smooth, fold in the vanilla, and set aside. The mix should pour in a ribbon. In a separate bowl, beat the egg whites until they form stiff peaks but are still smooth. If they’re not stiff enough, your mousse won’t set and turns to drool. If they’re over-beaten and start to clump in the mixer, your mousse will turn grainy. (I have managed to accomplish both of these feats once — but only once — over the years.) Fold into mascarpone/yolk mix. Mix the coffee and amaretto and pour into a shallow container not too much larger than the cookies. Dip the cookies in horizontally and turn. I turn each cookie 2 revolutions, which keeps the cookies moist but not soggy, and it takes 4 seconds or less. 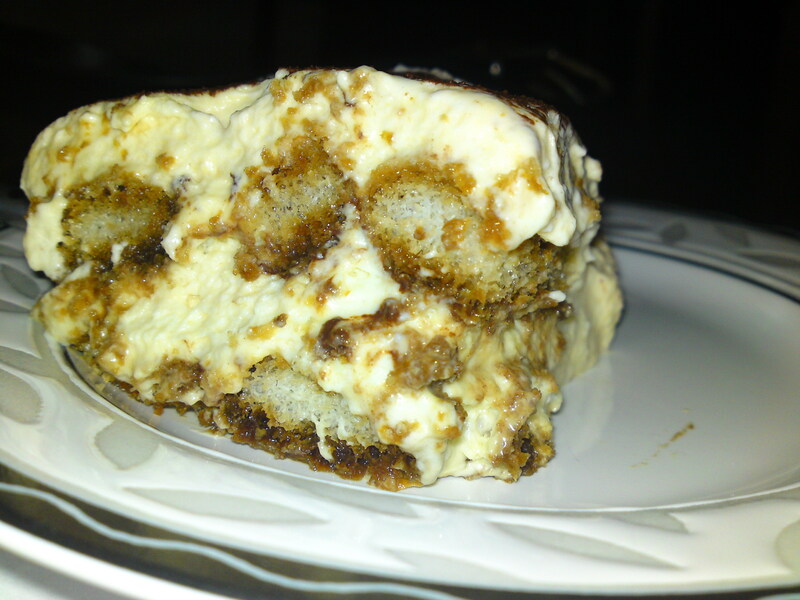 If you like your tiramisu “wet” with coffee, you may want to slow it down (and you’ll need more coffee). If you like it firmer and drier, try turning only one revolution. If you’re not sure, better to go too light than end up with soggy cookies. Cover the bottom of the dish with dipped cookies — snug, but not packed. You shouldn’t use more than half your liquid. Cover the moistened cookies with 1/2 the mousse. Dust with an even layer of powdered cocoa. Arrange a second layer of moistened cookies. 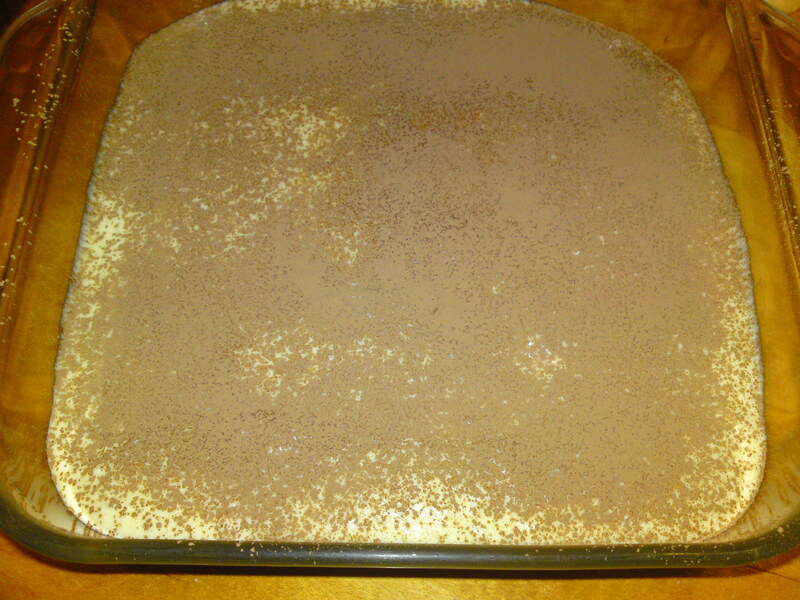 Cover with rest of mousse and dust with cocoa. Inspired to make it fancy? Cut a design into a piece of stiff paper and use it for a dusting pattern. Cover and chill for at least a couple of hours. (A day is better.) Enjoy!!! * Note: This recipe uses raw eggs, and although FRESH raw eggs do not usually carry Salmonella or other bacteria, it is possible. Such bacteria can be dangerous to small children, elderly, and sick people. Only use eggs from a trusted source. i enjoyed the description much more than the desert. However, with coffee this morning, it is indeed bliss on a screen. It should’ve been easy… The guests for tomorrow night have been invited, and promised Tiramisu (and the Chewy Italian Bread, but I wont start that until tomorrow), so we’ll see if they are still friends tomorrow **after** dessert. Making the espresso went fine. Separating the eggs was old hat. Egg yolks were nice & thick. Then it started… The Mascarpone cheese wasn’t at room temperature, but I am not known for my patience. Needless to say, after cold Mascarpone is beaten into the egg yolk mixture it does not, under any circumstances, pour in a ribbon. No problem, though, I can overcome it. So I opened the Ladyfingers. Not sure what the bakery was thinking, but they were like sponge cake (oops, forgot about that on the trip to the store). It was too late to do anything else so in the first one went. It was coffee-logged, and on the bottom of the dunking dish inside of a second. I do try to learn from my mistakes, so I dunked them about 1/2 second apiece, holding them with a serving fork, and in the serving dish they went. The egg goo was smeared on top, and followed by the cocoa powder. Wash, rinse, repeat, and in the fridge it goes. I guess the moral of the story goes something like “measure twice, cut once”, or “read the instructions twice, and do what they say” or something like that.